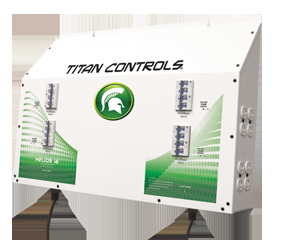 Sunlight Supply-Titan Titan Controls Helios 16 - 240V, 16 HID Light Controller Dual Timer (702835) SEEDS ETC. The Helios 16® lighting controller is specifically designed for operation of high intensity discharge (HID) lighting systems. The controller will run your lights for any timing pattern over a 24 hour period by plugging the relay ‘trigger cord sets’ into external appliance timers. There is a 30 second delay between each bank of eight (8) 1000 watt lights. This allows each 8000 watt bank of lights to strike before igniting the next bank of lights. The Helios 16® is easily serviced by a certified electrical professional by simply removing the front panel to access parts. The system can handle up to a maximum of sixteen (16) 1000 watt HID metal halide or high pressure sodium grow lights. This lighting controller will provide up to a maximum of 80 amps of capacity on a standard single phase 240 volt circuit. The ETL listed Helios16® is built with only the highest quality components and will provide the user with years of trouble free service. This controller will operate sixteen (16) HID lights at 240 Volts. Two (2) ‘trigger’ cord sets activate lighting controller via external timers.